Peking International Youth Hostel i Beijing, Kina : Boka nu! cancellation is allowed at least one week ago, please contact us in advance if you do not need the reservation anymore. 1. please contact us before made the reservation, so we can well arrange the room and dorm. 2. most of the room are dorms without private bath and toilet. 3. we are not allowed smoking and too much noise in the hostel. 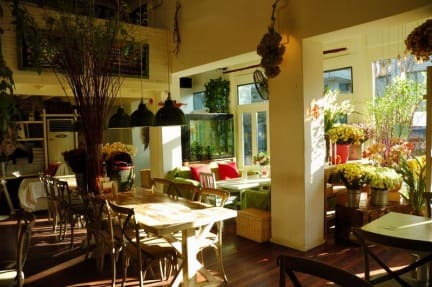 Översatt av Hostelworld gäster betygsatt Peking International Hostel de mest populära i Peking på 2011 Hoscars och det är inte konstigt - det rena, moderna och charmiga vandrarhem har boutique-stil gemensamma utrymmen och en restaurang på taket samt vaser av färska blommor hela som ger "en välkommen respit från de dammiga Peking gatorna ", som en resenär sa. Våra besökare berätta detta är "mer än bara ett vandrarhem, [det är som] lite pittoreskt boutiquehotell. Det perfekta stället att vila efter en dag i det trånga centrum ". Here, you are in the middle of Beijing’s most colourful Hutong district, just a few blocks north of the Forbidden City, just east of Houhai and Qianhai Lakes. 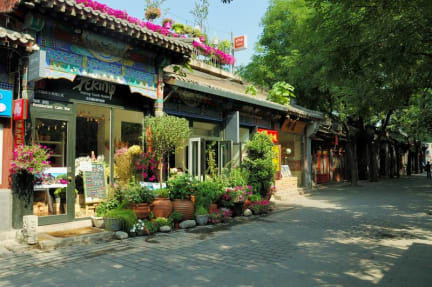 We’re set in a quaint, charming lane Nan Luo Gu Xiang in downtown Beijing. We offer you a huge choice of rooms, budget dorms, affordable double rooms and luxury rooms. The dorms are large and spacious. Great care has been taken in furnishing our spacious rooms to the highest standard, with top quality bunks and excellent bathrooms with showers. You can dine in our lobby or enjoy a cocktail in our bar. Why not come for afternoon tea in our Terrace Lounge, overlooking the Botanic Gardens? This is the perfect spot for your short break in Beijing – we’re near everything that is hot and happening. Catch a spectacular show or a profound play of Peking Opera or Chinese Kungfu. Whiz around galleries, museums and the Forbidden City. Why not ask our concierge for ideas or an itinerary created just for you? Go out and have fun, then come back home for some five-star luxury. We’re just 25 minutes’ walk from the Forbidden City and only 12 minutes’ walk from Beihai Park. We have a daily 3.5hr hiking trip from Jinshanling to Simatai great wall. We can also facilitate pick-up and drop-off at the airport. The hostel staff are amazing. Super helpful and speaks good english, i only wish the staff of the cafe did that as well. Wifi could be better, other than that its a great place to stay. Översatt av Vi ligger i en charmig körfält, bara fem minuters promenad från Houhai Lake och 20 minuter från den förbjudna staden. Jag rekommenderar folk definitivt besöka webbliknande labyrint av Hutongs.